Art Nerd New York founder Lori Zimmer shares her top art, design and architecture event picks for 6sqft readers! Times Square is offering up some pretty cool art experiences this week including a late-night 3D movie and vintage telephone booths that have been repurposed to play stories from immigrants to our great city. 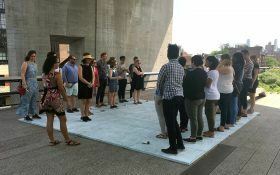 The High Line is holding a live chess tournament where pieces are swapped out for visitors, and Chesterfield Gallery hosts a group of artists who have swapped paint for textiles. Photographs celebrating the “limitless beauty of blackness” opens at Brilliant Champions, and artist Andrea Fraser gives a free lunchtime talk at SVA. If you’re out in the Hamptons, take some art with your beach time at Market Art + Design, and finally, rumor has it that the Kosciuszko Bridge will finally be imploded.